There are so many credit cards on the market, choosing the right card for your business can be overwhelming. In this series of reviews we’ll do the searching for you and help you make an informed choice. Bank of America’s Business Advantage Cash Rewards credit card has some great perks. With up to 3.75% cash back on some purchases, this card can be very useful for some businesses. The Business Advantage Cash Rewards credit card also has some other nice perks like a 0% APR introductory period, a high rewards limit, and no annual fee. The rewards are tailored for a slim crowd, with the highest cash back percentages given for gas and office supply purchases, followed by restaurant purchases. These rewards will not be useful to everyone. The APR rate can also be high for those with bad credit, and there is a foreign transactions fee. If you’re looking for a card that will be good for overseas transactions and a broad range of purchases, this may not be the one. 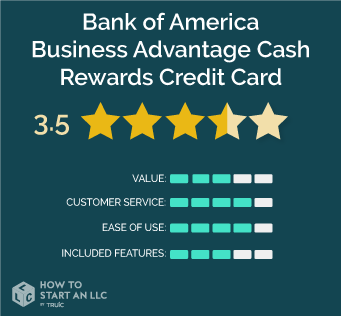 Who is the Business Advantage Cash Rewards Credit Card right for? If your business regularly spends a lot of money on gas, office supplies, or eating out, then this card may be useful for you. Business Advantage Relationship Rewards members may find the special added benefits of this card especially good for their business. With its high rewards limit, business owners who spend a lot on gas, office supplies, and eating out will find this credit card useful, especially those who are Business Advantage Relationship Rewards program members. The Bank of America Business Advantage Cash Rewards credit card is only useful for a slim audience. If your business uses a lot of gas, purchases a lot of office supplies, goes to restaurants a lot, or is a Business Advantage Rewards member then this card can be of great use to you. Otherwise, the benefits are limited. On the upside, with no annual fee, a 0% introductory APR, and a high rewards limit, this can be a great card for those who can use it. Bank of America has good customer service, and is accessible through phone and in person at any local branch. From our experience, their waiting times are not bad and their staff is knowledgeable and helpful. Of course, for such a large company 100% customer satisfaction isn't possible, so everyone's experience may not be the same. They do not offer online chat on their website. The Bank of America website is one of the better banking sites available, but is still not as great as Chase’s simplistic and organized approach. Their mobile app is also one of the best, with its simple user interface and user friendly menus. However, Capital One and Chase do a better job at organizing their user experience so everything you need is right at your fingertips. Some of the features like the high cash back rewards, 0% introductory period, and no annual fee make this a nice credit card for those who may find the rewards useful. The added features like travel and emergency services, fraud protection, overdraft protection, and introductory bonus are also great perks. The big drawbacks are that the rewards are only useful for a slim audience, the APR rate is high, and there is a foreign transaction fee, so those who travel or make transactions overseas will see some hefty fees. The Bank of America Business Advantage Cash Rewards credit card might be a good option for businesses who spend a lot on gas, office supplies, and host business meals often. It may also be a good option for Business Advantage Relationship Rewards members who will find some great benefits with those big rewards rates. The added benefits of the 0% APR introductory period and no annual fee are also great, but the card has a foreign transaction fee, a high APR rate for some businesses, and is generally beneficial to only a small audience.